Hello Friends! It's been a crazy few weeks with Red Ribbon Week, Halloween, testing, conferences, and on top of it all, next week is Thanksgiving! I know you can relate all too well. I wanted to quickly pop in and share what I'm planning to give my parent volunteers next week for Thanksgiving. I love spoiling my parent volunteers during the holidays. 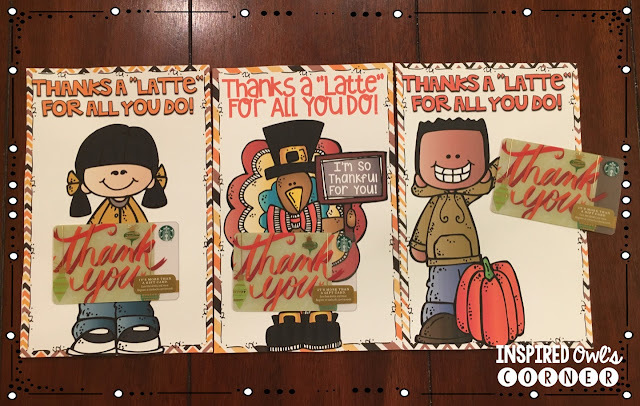 One of my favorite things to give them at Thanksgiving is a Thanks a Latte card with a coffee gift card attached and Bath and Bodyworks hand soap as a thank you for all they do for my students. This gift would also be perfect as a thank you for your colleagues. You can click on the picture above to download your own set if you want to make them. I will be making a Christmas set soon! Love this!! I can't wait to see the Christmas one!!! Thank you for sharing!